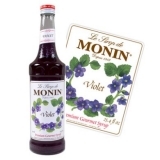 Monin Lavender syrup in stylish 70cl glass bottle. The light purple, heavenly scented lavender fields of Provence, France, come to mind. Most people associate lavender with its uses in perfume and aromatherapy. 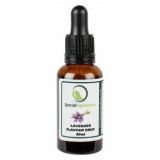 Lavender has been used for millennia, at least since the Roman Empire. A lovely flower used for many decorative items, lavender is a great accent in many recipes from entrees to desserts. Monin Lavender features a beautiful colour and distinctive aroma to remind you of the colours and scents of Provence. Monin Lavender is part of Monin's unique bouquet of floral flavours that also includes Jasmine, Rose and Violet. All Monin florals are ideal to impart fresh floral aromas to a surprising variety of speciality beverages and foods. Colour: Transparent bright purple colour. Taste: Nose of lavender fields of French Provence, sweet and strong taste of dry lavender. Applications: Cocktails, teas, sparkling, sodas. Sugar, water, lavender essential oil, acidifying agent: citric acid, colouring agents: E129, E133, preservative agent: E202. Please note: Not compatible with cold milk, steamed milk, coffee or chocolate.